“You shoulda seen it. The corn dog was this big! And I ate the whole thing!” The audience roars its approval. You’ve got to admire the discipline of the Republican Party. They managed to make it through their three-day convention with only a few racist incidents. Truly, this is a party ready to rule. 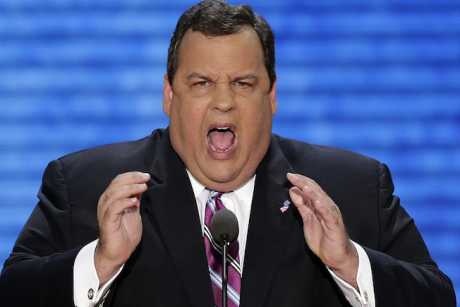 In his keynote speech, Chris Christie, the morbidly obese governor of New Jersey, bragged about how his state has had a balanced budget three years in a row. This drew rapturous applause from the audience. Of course, Christie neglected to mention that New Jersey’s economy is doing worse than the rest of the country’s. After all, balanced budgets don’t create economic prosperity. Had Christie mentioned this fact, though, it would not have mattered to the delegates. For Republicans, a balanced budget is the Holy Grail of public policy. It is the ultimate goal of their holy quest. Strange to say, the last three Republican presidents failed to have balance budgets, an unfortunate result of their enthusiasm for foreign adventures and tax cuts for their friends. Ah, human frailty. There has been a lot of grousing about all the lies that Paul Ryan told in his acceptance speech. Well, what do you expect the poor guy to do? Do you really think people are going to get excited about the prospect of paying higher taxes just so that rich people – er, I mean job creators – can pay lower taxes? So, instead Ryan takes us into an alternate reality, complete with tangerine trees and marmalade skies. As for Clint Eastwood’s much maligned speech, I actually found it entertaining. My only criticism is that instead of an empty chair, he should have had a ventriloquist dummy that looked like Obama. That would have worked more smoothly. I noticed that when Eastwood mentioned that Obama has been going around to colleges and universities to talk about student loans, the crowd laughed uproariously. I guess there is nothing that old white people find funnier than the thought of the younger generation drowning in debt. Romney’s speech was simply dull and dishonest, which was appropriate for the occasion. This entry was posted on September 2, 2012 at 7:00 am and is filed under Mitt Romney, Republicans. You can follow any responses to this entry through the RSS 2.0 feed. You can leave a response, or trackback from your own site.